Elisabeth has over 40 years experience in health services. She has chaired Strategic Health Authorities, NHS Trusts, served as NED or advisor in the private sector and charities and is currently chairing Eastern Academic Health Sciences Network and Walsall Refugee and Asylum Seeker Support Association, and is Chair of Accord Housing Group and a team leader of the Big Feed. She is an Independent Reviewer for DeepMind Health. Elisabeth has worked within the voluntary sector on local, National and European projects including running a post-graduate module on Patient and Public Involvement at Warwick University. A NED on the NHSBT for nine years, Elisabeth chaired the UK Organ Donation Taskforce from 2006-9, publishing three major reports on ways to increase organ donation, radically improving access to transplants and saving the NHS many 100M. 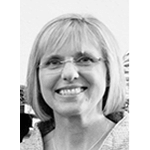 Elisabeth was given a CBE in the New Year Honours in 2008, has two honorary doctorates and honorary life membership of the British Transplantation Society.